ValuTrac Software, provider of the industry’s most configurable appraisal management software for both residential and commercial valuations, has announced the launch of SnapShot automated appraisal review, a low cost, streamlined appraisal review tool available through ValuTrac Software’s ValuTrac Pro and ValuTrac Pro Plus. 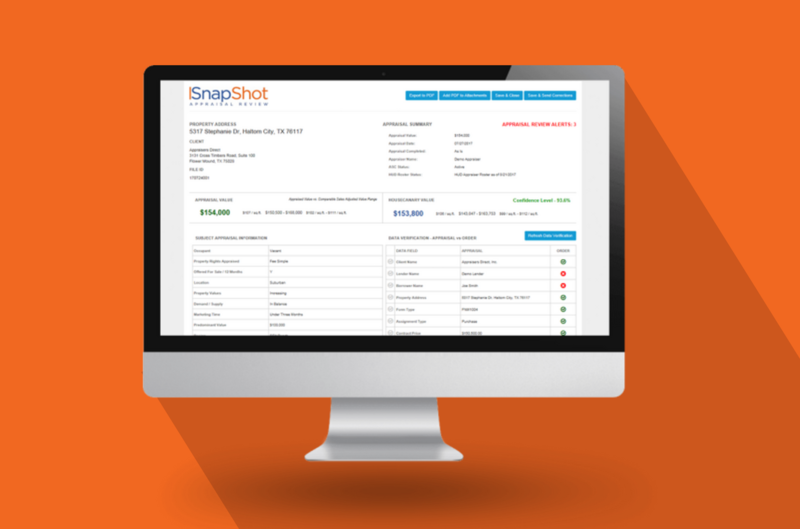 SnapShot was designed for organizations that want a faster, more streamlined automated appraisal review. SnapShot supports Fannie Mae appraisal forms 1004, 1073, 1025, 1004C and 2055, and can be set up to run automatically when appraisers upload an appraisal report. SnapShot uses a streamlined, predefined set of rules, which vary based on appraisal form. Users have full control over all automated rules and they can also include manual review questions. Users can set SnapShot to flag findings as hard stops or warnings, based on their quality assurance procedures. SnapShot evaluates data fields for errors, omissions and inconsistencies, cross references the appraisal’s data against the appraisal order’s data, and verifies appraiser status according to ASC (Appraisal Subcommittee) and HUD (U.S. Department of Housing and Urban Development) rosters. SnapShot also displays the appraisal value with the comparable sales adjusted value range provided in the report, and a HouseCanary automated valuation and confidence score.